Texas Independence Day may have been yesterday, but we just found another reason to celebrate. There’s a map that shows which states belong to which music artists (on streaming services) and Texas’ result is perfect. 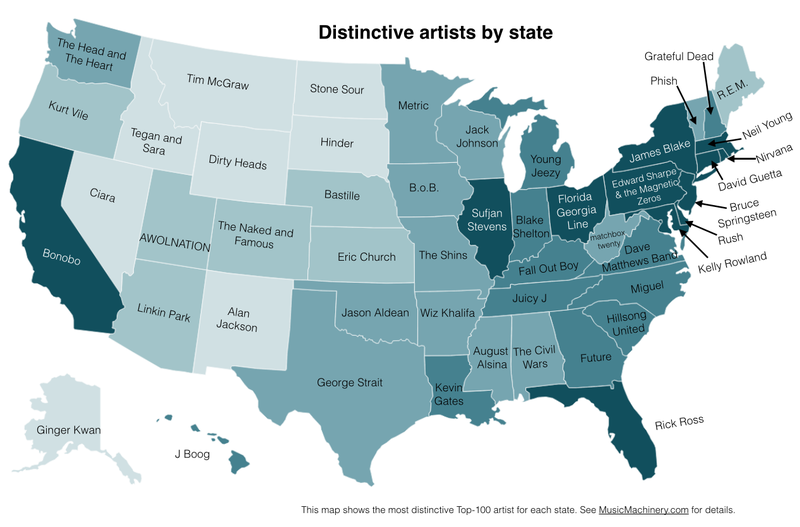 Echo Nest blog site The Music Machinery released its findings on the top music artist in every state. George Strait, also known as King George, led the way in Texas, on a 2014 chart based off of the streaming listening patterns of more than 35 million songs by about 2.7 million artists on 432 apps and services. The map is color-coded according to population density. Other country artists took states like Oklahoma, Kansas, New Mexico, Montana, Indiana, Ohio and Alabama. It’s interesting to look at the findings compared to where artists are actually from. For instance, Florida-Georgia Line does well in Ohio, but not in Florida or Georgia. And Stone Sour and Hinder still make music? Huh. My favorite stat, however, is that Wisconsin folk love Jack Johnson. Maybe it’s all the cold winters? Anyway, it’s clear that George Strait still has a stronghold on his home state. And if the same data was ran again this year, Texas’ result would probably be the same. Which part of Austin made a 'sexiest neighborhood' list?